People say that the land beneath Paris is like Swiss cheese. Outside the frequented subway, most tourists and residents spend their lives aware of only the Paris aboveground. But beneath the thin slice of city on the crust is a vast city below known only to a few. Since the start of the Middle Ages, Paris has been built just as much underground as it has above. As deep as 30 meters below the city, subways, sewers, telephone grids, quarries, water lines, bomb shelters, crypts and tunnels for both the living and the dead form one of the largest man-made underground networks on the planet. Just before the 19th century, Paris public health officials ordered all the cemeteries inside Paris closed. The remains of some six million dead, three times the current living population of Paris, needed to find a new final resting place. A network of quarries below the city was the decided destination for the bones. If you have ever wondered now much space six million skeletons take up, the answer is a massive amount. 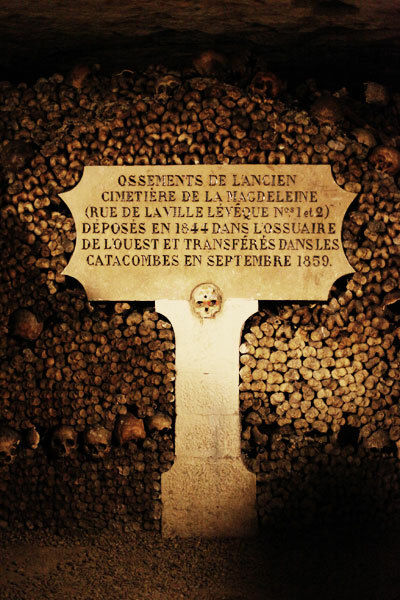 Le Tombe-Issorie, now simply known as Les Catacombes, is a city for the dead below the city for the living. These anonymous bones are stacked underground in macabre arrangements. Visitors are welcome in select areas of the catacombs, but because of its massive size, most of it remains forgotten. Or at least, forgotten to public. The forgotten maze of taverns and passageways in the catacombs has spawned a class of people called cataphiles, or catacomb lovers. Using old maps of the quarry, and using technology to make digital layouts, these youthful lawbreakers have become masters of this underground world. 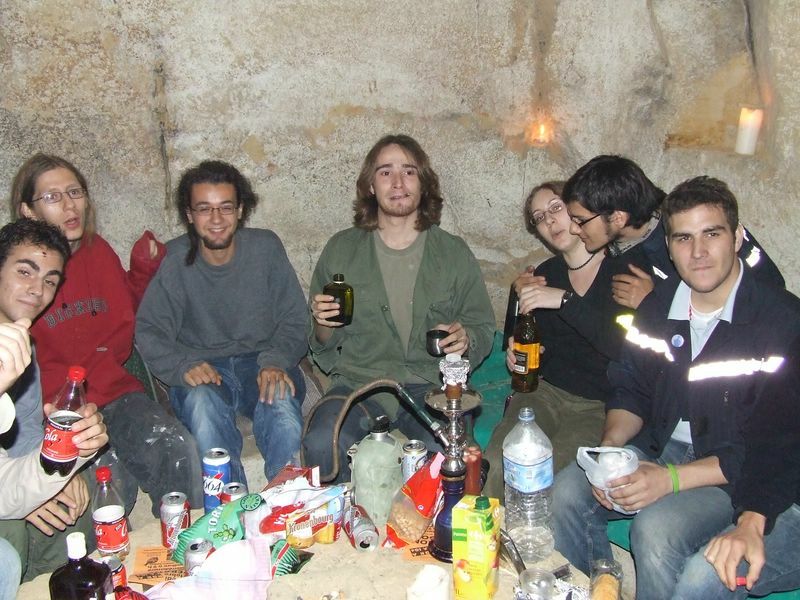 Equipped with headlamps and knowledge of these forbidden caverns, they escape to Paris’ underground where they gather in groups around campfires, drinking beer, playing guitar and, of course, making crapes. Though these groups normally number only a few, there have been underground concerts in these caverns with hundreds in attendance. The cataphiles are drawn here by the same force that has always drawn youth: an exciting place that they are forbidden by law from entering. “Yes!” my friends answered, and we began to make plans. But having only a short time left in Paris was not enough for these plans to be carried out and I left without a visit to them. I learned that when doing illegal things in Paris, you should give yourself at least a few days to plan properly. I was at least able to talk with Parisians who had been visitors to this underground world. They showed me photos and told me their tales. Visiting subterranean Paris outside designated areas is not to be taken lightly. Authorization is imperative, as is strict adherence to safety regulations. Otherwise, intruders may be prosecuted, or worse. Serious accidents, deadly accidents, do happen. We will spare you an exhaustive list, but intruders run the risk of falling, drowning; being asphyxiated by toxic gases, being electrocuted; being crush by falling rocks, catching any number of infections, and getting lost. Not finding a good cataphile guide in time, I opted not to run these risks. I would not recommend anyone taking them. Having said that, sound advice is not what stops risk-takers from taking risks. People run risks all the time for a thrill. We jump out of planes, attach bungee cords to ourselves and jump off bridges, and go careening down snow-covered peaks with one or two boards attached to our feet. Traveling, and just living, is risky. Since the size of the catacombs makes it virtually unguardable, cataphiles will continue to visit, and if you talk to one of them, they will encourage you to join them and tell you that it is not risky if as long as you know what you are doing. I have heard that said many times and seen both positive and negative outcomes happen to those uttering these words. So if I go to Paris again, an unofficial visit to the catacombs will certainly be something I will consider.